It isn’t fair, but the truth is that the better the picture, the easier it is for food to get noticed. There isn’t smellovision or tasteagram, so the only way to judge food online is through what you see. This means that a premium is placed on great food photography. If you have an interest on food photography, you can get this FREE course delivered right to your inbox, simply by signing up here! This is the perfect way to begin to explore the world of food photography! 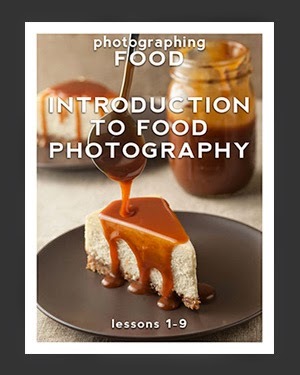 However if you are seriously interested in photographing food, take a look at the photographing FOOD PDF series. 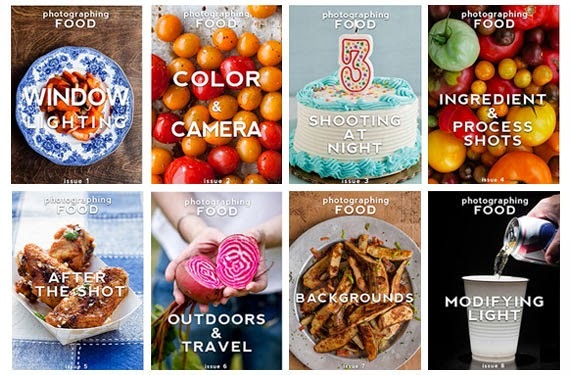 Each issue is 35-40 full color pages that give you a behind the scenes look at what it takes to consistently create beautiful images of your food! Photographing FOOD is a food photography education resource designed for Journalists, Bloggers, Food Purveyors, Amateur and Professional photographers who are eager to improve their food photography! Photographing FOOD is a system designed to give you the skills necessary to consistently create mouthwatering pictures of food that look as good as the food tastes. This isn’t like your traditional book series. To keep you from feeling overwhelmed, each issue is centered around one photography topic and how it specifically relates to food photography. You are given a behind-the-scenes look from start to finish, ending with a final shot with all the exposure information. Any level of photographer will be able to understand and quickly apply the techniques discussed. You don’t have to have the most expensive gear. Most of the issues are shot in a garage studio and give solutions at all price points. Photographing FOOD is designed for reading on your phone or tablet! This means that you can download the issues and take them with you to read at your convenience and on your schedule! So if you are serious about your food photography, just click on the banner below. I take photos of everything I cook. LOL.